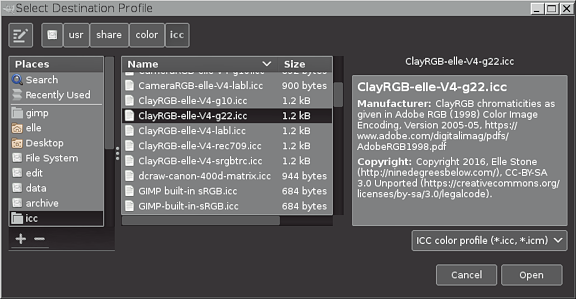 The Assign Color Profile allows you to assign a new ICC profile to an image. You can access this command from the image menu bar through Image → Color Management → Assign Color Profile. If the image really is an sRGB image, then no further action is required. 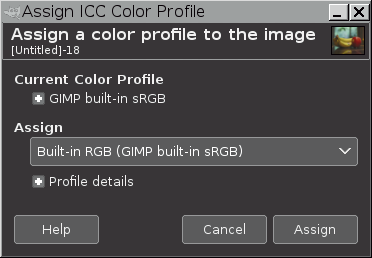 If the image is not an sRGB image, then use Assign Color Profile to assign the correct ICC profile from disk. The image might have an embedded ICC profile, but maybe it's not the right profile for the image, or maybe it's just not the profile you want assigned to the image. Use Assign Color Profile to assign another profile from disk. 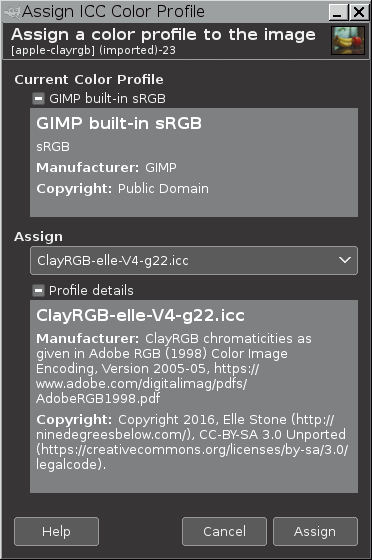 The image might have an embedded sRGB profile, but you want to assign a GIMP built-in sRGB profile in place of the embedded sRGB profile. 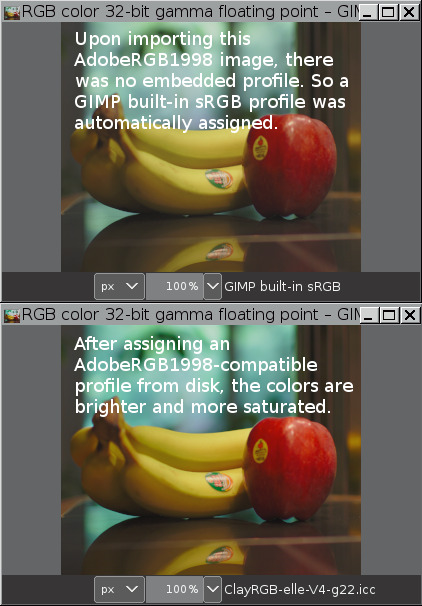 Or conversely, maybe the image is in GIMP's built-in sRGB color space, but you want to assign an sRGB profile from disk. Let's say you just imported an image file that you know should be in the AdobeRGB1998 color space. But for any number of possible reasons the image doesn't have an embedded ICC profile. 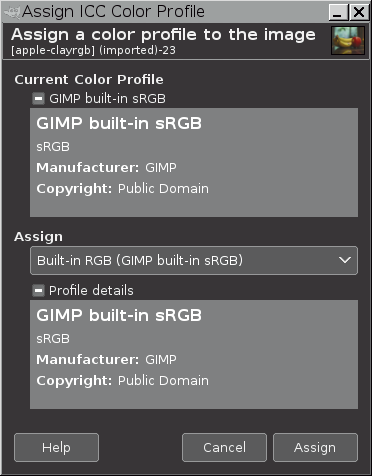 Under Current Color Profile is a description of the currently assigned color profile, in this case GIMP's built-in sRGB profile. Clicking on the "+" icon next to the description of the currently assigned profile displays the contents of various information tags in the assigned ICC profile. Clicking on the "+" icons next to the words Profile details displays the contents of various information tags in the ICC profile that you pick to be assigned to the image. 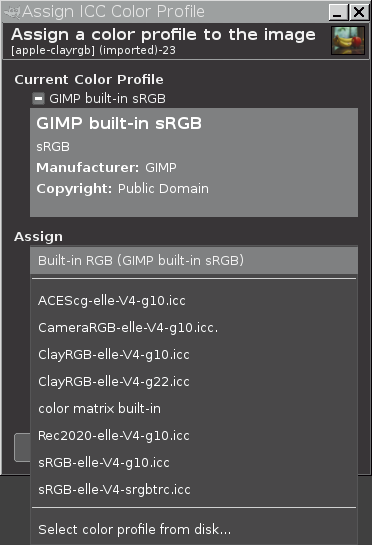 Until you've actually picked a new profile, the profile in the Assign box defaults to a GIMP built-in sRGB profile. The panel on the left allows you to navigate your on-disk folder structure to the folder of your choice. The center panel initially shows another list of recently used profiles. If you click on one of the recently used profiles, the right panel will show informational tags that are embedded in the selected profile. If the profile you want to select is shown in the list of recently used profiles, the profile can be directly selected from the list of recently used profiles by clicking on the Open button in the lower right corner. However, as the desired profile isn't in the list of recently used profile, the next step is to navigate to the profile's location on disk. As shown in the screenshot below, the left and center panels of the Select Destination Profile dialog allow you to navigate to where your ICC profiles are stored on disk, and then pick an appropriate ICC color profile (in this example, an AdobeRGB1998-compatible profile), and the right panel displays informational tags embedded in the selected profile. Click on the Open button to assign the selected profile to your image.